In the TechTips #82 & 83, I covered the process we went through in making the decision to replace our Coach Batteries with a Lithium-Ion one and the other changes required to optimize the conversion. I mentioned that I am very satisfied with the improvement. There are some further thoughts about the conversion and what this technology will mean to the industry going forward that I’ll cover in this TechTip. You will recall that I had changed the Chassis Batteries just six months earlier and since everything on that system was operating optimally, I decided to leave those batteries as they were. Thus, only the Coach Battery was changed. This meant that I have AGM and Lithium-Ion batteries being charged by the same charging systems. While they have somewhat different charging profiles, the AGM is fairly close to the Lithium-Ion. The primary difference is the time for charging (which is shorter with the Lithium-Ion battery). The AGM batteries are "strictly chemical reaction” batteries without any integrated control, whereas the Lithium-Ion battery has a Control Board that regulates the charging. This feature allows both batteries to be charged since the Lithium-Ion Battery cannot be overcharged. To ensure that the charge rate used for this new battery did not deteriorate the AGM chassis batteries, I moved the temperature sensor from the coach battery, where it was no longer needed, to one terminal of a chassis battery. This sensor monitors the temperature of the battery at that terminal. When the inverter/charger is charging, the sensor provides feedback to the inverter control board allowing it to modulate the rate of charge according to the increase in temperature of the battery. While the new charging profile is unlikely to cause any significant deterioration of the Chassis Batteries, should the battery temperature increase significantly, the rate of charge will drop thereby protecting the chassis battery. Since the new charging profile for the Lithium-Ion battery is similar to the rate and type of charging the battery would see when being charged by the engine driven alternator, there was not a lot of concern. On most modern coaches there is a system that charges the Coach battery first, when connected to 120 Volts AC, then it brings on the chassis battery for charging. When driving, the system works in reverse, charging the chassis battery first, then bringing in the coach battery for charging. The last change, which we have yet to implement, is the Auto Gen Start (AGS) settings. Since the AGS never sees a voltage less than 13.2V (typically) it does not sense the need to start the generator to charge the batteries. In conversations with knowledgeable personnel at Onan, I learned that Onan is in the process of developing a revised AGS controller that will allow more flexibility in the threshold battery voltage at which it will start the generator, thereby powering the Inverter/ Charger. The changes will also allow flexibility in the voltage level at which it will turn off the generator, once it is determined that the batteries are fully charged. As an interim (creative) solution, their technical support suggested installing a (variable) resistor in the battery sense lead connected to the AGS control that can be adjusted to reduce the sensed voltage coming from the new battery to the match the existing preset Generator Start Voltage level. The system will run start as needed then run until it either it reaches the fully charged threshold (which can be set appropriately) or have run for a predetermined time, then shut down. While the voltage the AGS "reads” is not the actual voltage, it will act just as if the voltage was an accurate reading of a battery needing to be charged. I will implement this change over the next few months, when I begin using the coach again. I have learned that my instincts about batteries and charging have had to adjust to those of this new power system. I found it is hard getting used to: "What is fully charged (13.5-13.7V) versus being in need of charging (13.2V)?” Adapting from Lead-Acid Batteries and their characteristics requires that you leave behind much of that wealth of knowledge gained over the years and make the leap to different parameters. A parallel that I think captures the power system change from Lead Acid to Lithium-Ion is the jump that many of us made when we switched from a Gas engine equipped chassis to a Diesel-equipped one. That change required an immediate upfront cost that may not have been able to be justified strictly from a dollar expended perspective. That decision also came with a plethora of new systems from stronger chassis components, larger tires, air brakes, an exhaust brake, air suspension, increased carrying capacity, a tag axle, hydraulic systems, an inverter and so on. 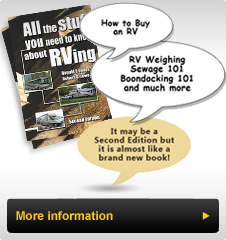 All of these changes required a large educational process for us to become familiar with simply because we made a decision to choose a diesel engine in the chassis for our next RV. We had to relearn a lot about what we thought we knew about driving, maintenance, even where to purchase fuel and maintain that system, let alone the myriad of others. The comfort, convenience, ride characteristics and thrill of it all truly changed our perspective on what it meant to "RV”. Similarly the implementation of Lithium-Ion Battery systems will ultimately provide a more efficient, lighter weight, dependable electrical energy source, with systems designed to optimize the characteristics of this power. It will be especially important for those who like, or need, to be self-sufficient. It is likely that batteries will never need to be replaced. Maintenance costs may fall since the electrical components will always be operating at their designed voltages, quicker charging will mean less engine power needed to charge them, corrosion of connections will likely have less of an impact on performance. As these power systems become prevalent, equipment designed to take advantage of this new power source will arrive. This is already happening in Smartphones, portable consumer electronics, portable power tools and many other consumer items. A Lithium-Ion battery power system is not for everyone, at this point. Emphasis is on the word "System” – the battery is just one part of it. While there are many benefits, some obvious, others more subtle, I suggest that to get a reasonable return on your investment, you will need to be the type of RVer that often boondocks or travels to locations where power may not always be available. I think that it should be an available option on high end coaches, especially if effort has been expended to integrate their advantages into all of the on-board electrical systems. Who knows, we might be able to run our whole coach and chassis on one Lithium-Ion Battery, with an integrated Inverter/generator that is far more efficient than today’s versions. It will also require additional training of RV Design Engineers and Service Technicians who will design, install and service these systems, both on the assembly line and in the field. Integration at the engineering level will require collaboration of suppliers and production engineers. This transition will be even more difficult as both old and new systems will co-exist for the foreseeable future. The decision to retrofit a coach will require that the owners educate himself/herself about the conversion and the expected outcomes so that they can truly enjoy, use and understand the system. While I have not mentioned it up to this point, the removal of lead from batteries is a responsible environmental move given the substantial toxicity of lead to health. Lithium-Ion batteries contain little toxic material. The recent press surrounding aircraft fires equipped with these batteries has been addressed by the makers by either enclosing the batteries in a fireproof container or adding fire retardant to the battery contents. Stainless steel containment inside a protective outer casing tends to make these batteries quite safe. From my perspective the answer is Yes! They are available on some Class B coaches. At the very least, they should be an option on the increasingly more sophisticated, luxury coaches in today’s market.